In lecture we learned about the use of vaccines as a preventative measure for cancer, but what if a vaccine could be used to cure cancer? Results from a recent phase 1 trial suggest that this may be a real possibility. After intravenously injecting myeloma patients with the MV-NIS, a genetically engineered measles virus, researchers observed them reach a state of complete remission. With any cancer treatment, the question arises of how to target and kill a patient's cancerous cells without harming the normal healthy ones. MV-NIS works because it is able to target the complement regulatory protein, CD46, that is much more highly expressed in myeloma cells. CD46 is found in the cell membrane of myeloma cells, thus providing an easy target for the virus to fuse to cell surface receptors, enter, and infect the cell. "NIS" signifies the gene for a sodium iodide symporter that was added to the viral genome to allow for radioactive tracing of iodine in infected myeloma cells. As seen below, scanning techniques take advantage of this radioactive quality and are able to show the high specificity and rate of uptake/infection of MV-NIS within a tumor. Intratumoral propagation of systemically administered MV-NIS. A, Serial single-photon emission computed tomography (SPECT)–computed tomography (CT) images from patient 1 at baseline (d-1) and on days 8 (d8) and 15 (d15) after MV-NIS infusion at the level of the left frontal plasmacytoma. Two adjacent transaxial slices from 6 hours after isotope administration are shown for each time point. There is a small area of increased uptake in the plasmacytoma visible in the lower slice on the day 8 scan (circle). This area of increased uptake is more extensive, and visible in both slices (circles), on the day 15 scan. B, Serial SPECT-CT images from patient 2 at baseline and on days 8, 15, and 28 (d28) after MV-NIS infusion at the level of the inguinal region. Compared with the baseline images, there is greatly increased radioiodine uptake in a deep-seated intramuscular plasmacytoma in the right hemipelvis on day 8 after MV-NIS administration, which is diminishing by day 15 and is back to baseline by day 28 (arrows). On the same transaxial slices, there is moderately increased radioiodine uptake in the large left inguinal lymph node on day 8, which again is diminishing by day 15 and back to baseline by day 28 (arrowheads). 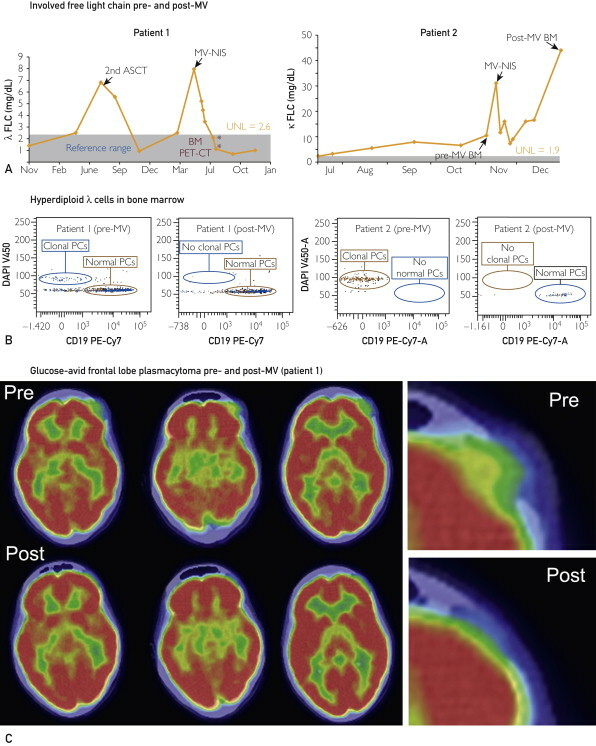 C, Anteroposterior fluorodeoxyglucose positron emission tomography (PET)–CT image obtained before MV-NIS administration and the corresponding iodine 123 SPECT-CT images obtained 8 days and 28 days after virus administration. All areas of intense radioiodine uptake (aside from the bladder) in the day 8 SPECT-CT scan are seen to correspond to glucose-avid plasmacytomas in the PET-CT image (circles). Because this therapy makes use of a virus, the patients receiving the treatment needed to be seronegative, showing no sign of previous exposure, otherwise their antibodies would recognize and attack the virus before it had a chance to infect the cancer cells. Since eligible patients cannot have preexisting immunity, I wonder about the risks of introducing such a deadly virus into the body of a severely immunocompromised person. I would think a major concern with this therapy would be an accidental infection due to the patient's state of immunosuppression. The chosen patients were at high risk of death given a lack of response to multiple rounds of previous treatments, so I suppose that, for them, the potential benefits outweighed the risks. Two of the patients from the trial were given the highest dose, 1011 TCID50 (50% tissue culture infectious dose), in 100mL of saline over the course of an hour and monitored carefully. Two hours post treatment, both experienced adverse effects, becoming febrile, tachycardic, and hypotensive, with fevers recurring days later. However, the treatment was deemed effective given significant decreases in plasmacytoma (tumor) size as seen in part C of the figure below. Clinical response to systemically administered MV-NIS. A, Serial free light chain (FLC) measurements in patients 1 and 2 as a surrogate of myeloma tumor burden, increasing at myeloma relapse and decreasing after successful therapy. Asterisks indicate the timing of relevant bone marrow (BM) and positron emission tomography–computed tomography (PET-CT) examinations. B, High-sensitivity 8-color plasma cell (PC) flow cytometry performed on pretherapy BM samples from both patients (left panels) shows CD38- and CD138-positive, CD19-negative monoclonal PCs (λ-restricted in patient 1, κ-restricted in patient 2) with hyperdiploid DNA content. In these same studies performed on BM samples obtained 6 weeks after therapy (right panels), the abnormal PCs are not present. C, Alternate coronal PET-CT sections at the level of the left frontal plasmacytoma in patient 1 before and 7 weeks after MV-NIS therapy. Far right panel shows higher magnification of the middle sections, focusing on the plasmacytoma. Note the pretherapy cerebral compression and altered skin contour that normalize after therapy. ASCT = autologous stem cell transplant; DAPI = 4′,6′-diamidino-2-phenylindole; MV = measles virus; UNL = upper normal limit. It is notable that these results were obtained after only one intravenous dose of the virus. While other cancer therapies must be repeated over a long period of time in order to be effective, MV-NIS demonstrated its promise as a "single shot cure". Given the success of these results, a phase 2 trial is in the works. Questions that still need to be answered include the optimal timing (how long should the IV be administered for), viral load, and dosage (number of IV "sessions"). For those who are interested, click here for a short video discussion of this research by a Mayo Clinic professor.